It was an ordinary day in every way. Like any other day Raunak had gone to office expecting another good day at work. And a late evening ride with Lajjo in their Mercedes. Like any other day he had loads of work in the office and he had happily immersed himself in his work. But one call in the afternoon changed everything. And converted that day from an ordinary to an extraordinary one. It was Lajjo’s call. 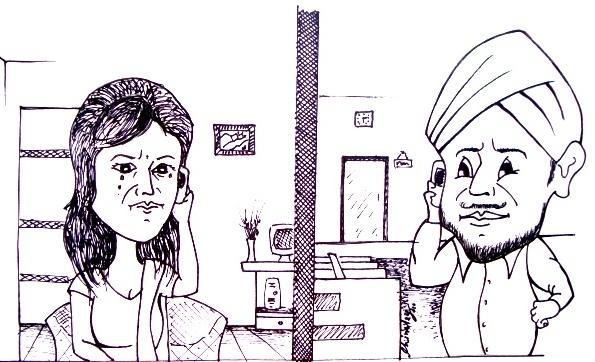 Even before Raunak could ask Lajjo the reason of her call, he could hear sobbing from the other end of the receiver. Raunak was immediately jolted out of his work mode. His queries were answered with silence. “Why? What happened?” Raunak’s mind went on a speculation mode, thinking of all the things that could have gone wrong. Raunak didn’t ask Tukaram to come and pick him up from office. Keeping in mind the urgency of the situation, he thought it best to catch a cab and go home immediately. Considering the situation at home, it was a wise decision. Raunak knew something was wrong the moment he entered the drawing room and saw Sandeep, his brother-in-law sitting on the couch with a somber looking face. And Lajjo couldn’t stop herself from embracing him and breaking down into sobs. Knowing well enough that Lajjo was too shocked to say anything, he looked towards Sandeep for help. “It’s the driver, Tukaram” said Sandeep, in response to the silent questioning from Raunak. “What’s with him? What happened?” asked Raunak, frowning, still consoling Lajjo. “What?” Raunak asked, disbelievingly, “What did you say? Tukaram tried to …” Raunak couldn’t complete the sentence. He looked at Lajjo and immediately understood what must have happened. Raunak felt a surge of aggression in his body. Anger seemed to have replaced the blood in his veins. His first impulse was to get hold Tukaram and beat him to death. He let go of Lajjo and rushed towards the door swearing and cursing Tukaram. “Where are you going?” asked Sandeep, standing in front of him. The suggestion of a police complaint did the trick. With an unprecedented determination, Raunak accompanied Sandeep to the local police station and filed a complaint. Sandeep was right. Tukaram was indeed nabbed by the police after a week. He was found in Nagpur. After a little more search, it was discovered that Tukaram was held by the police in his hometown Sangli previously too in similar cases. He was also known in his neighborhood as a characterless person and used to be regularly beaten by the local people for teasing women. It took a few days for the Raunak and Lajjo to get back to their normal life. But Raunak Singh was now convinced of one thing. The Mercedes had to go. And this was the last they had seen of any driver. But fate had some other plans for them. What plans? You will find out in a week’s time.